� In January 2018 Klineman and teammate April Ross won an FIVB event in The Hague, becoming the first woman to win a gold medal in her first ever international beach event. The duo also became just the third team to ever win an FIVB title after first competing in the country quota. 2018: Klineman and April Ross played in seven AVP events, winning the season opener as well as the last three tournaments of the year. The duo had a 30-3 match record, including winning the final 15 matches of the season. Klineman ended the year ranked third in hitting percentage (.491), fourth in aces (.96 per set) and fifth in blocks (1.09 per set). Klineman and Ross played seven times on the FIVB Tour, winning in Klineman's first ever international event. In that victory, the duo won 10 matches including the country quota and qualifier, dropping just one set total, and beat three of the top four main draw seeds. The pair finished fifth in four other FIVB tournaments. 2017: Klineman began the season with three AVP events with Jace Pardon. The duo advanced from the qualifier in their first tournament together, then were seeded directly into the main draw before losing in the qualifier in their third event. She then played one qualifier with Branagan Fuller. 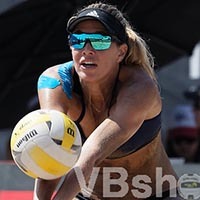 In the final four AVP events of the season, Klineman played with Lane Carico, finishing second and then third in their first two events as partners. She ended the year ranked second on the Tour in both blocks (1.25 per set) and aces (1.10 per set). 2016: Playing with Kristin Hildebrand, Klineman competed in one AVP qualifier. 2006: Klineman played two AVP qualifiers but did not advance in either, playing once with Kashi Cormier and once with Geena Urango. 2005: Klineman made her pro beach debut at the age of 15 at the Manhattan Beach Open, finishing 33rd alongside Stephanie Barry. College: Klineman played indoors at Stanford, where she was named Volleyball magazine's National Freshman of the Year in 2007 as the Cardinal played in the National Championship. As a sophomore Stanford again reached the National Championship and Klineman was named AVCA First-Team All-American. She was a Second-Team All-American as a junior, then as a senior was Volleyball Magazine's National Player of the Year. Klineman became just the second player in program history to surpass 2,000 career kills (2,008), and finished with 1,125 career digs. Personal: Klineman has a brother, Max, who played volleyball at UC-Santa Barbara, and a sister, Maddy. She was chosen as the 2006-07 Gatorade National Volleyball Player of the Year and PrepVolleyball.com's 2006 Senior Player of the Year. A four year starter at Mira Costa High School in Manhattan Beach, she guided the team to a 134-10 mark during her varsity career. Her high school team won three consecutive state championships, and she was selected as the state tournament MVP twice. She set school records for aces (52) and hitting percentage (.494) as her team finished with a 37-1 mark her senior season. Klineman led the 2006 U.S. Women's Junior National Team to a gold medal at the NORCECA Continental Women's Junior Championship, leading the team in both points and kills. Following graduation from Stanford, Klineman played professionally indoors in Italy and Brazil.